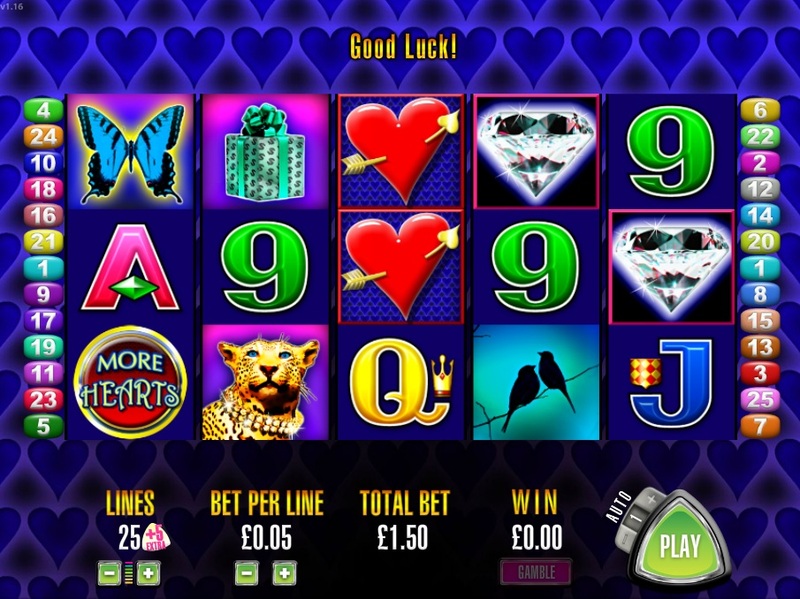 An addition in February 2013 to Aristocrat's growing online slots portfolio was More Hearts, a game that has already proven popular in land based casinos. The name might suggest a romantic element to the game, but it is hard to work out what exactly the theme is when you see wild animals and gem stones on the reels. Let's just assume it is to do with things that lots of people love. I mean, we all know someone that loves birds and lions right? Ok, we'll go with that angle then! 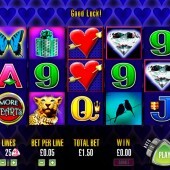 Although this slot is quite unique, it does have similarities to the very popular More Chilli slot, which has also been released online. You may notice that there is a +5 paylines option, which gives you 30 paylines instead of the standard 25. My advice is to take the extra lines as they will increase the RTP by an extra few percent, giving you more winning possibilities. To do this click on the (+) sign under the heading 'Lines' to add them. The bonus round in More Hearts is triggered by landing three or more of the More Hearts Scatter symbols anywhere on the reels. You will be awarded 15 free spins (if you chose the extra 5 paylines), but here is where the game differs from most normal Aristocrat slots. The screen will then be divided into four, with two games running simultaneously. A third game will open if you manage to land 9 hearts within the free spins and forth will open should you land 14. If you manage to do it in quick succession you could have four games running free spins, even better if the bonus re-triggers! Anyone that has played any of the multi-game cabinets in the casino will know this can be quite rewarding at times. There are a few misses with the More Hearts slot though. Firstly, the stacked hearts symbols do nothing during normal play, which is quite annoying. Also there is little reward for landing more than three scatters, when really you should be getting extra free spins. However, I do think it is an excellent slot and I would recommend you at least give it a go if you are a fan of the games produced by Aristocrat.